I'm back today with what I want to class as a crafty post? Kind of anyway but nevertheless it’s fun, simple and easy on the purse too! Being a dog owner, I like to do what’s best for Harry and know that he’s eating good quality food. 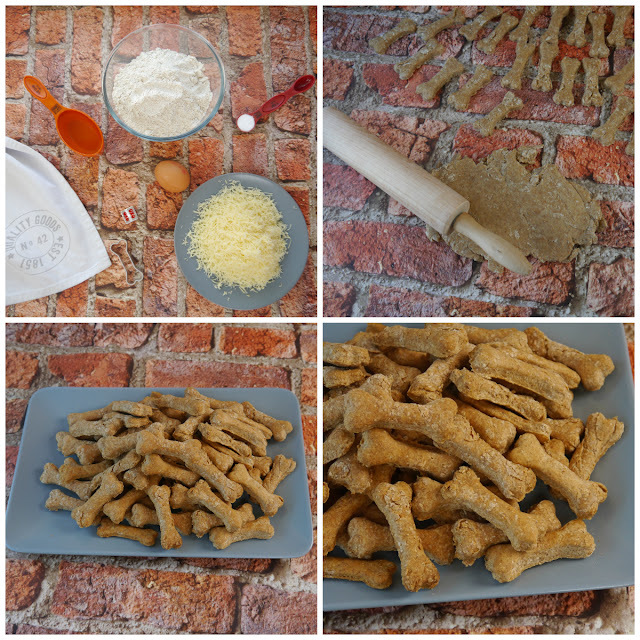 I’m also a crafter and thriftier at heart so with that in mind I thought it’d be fun to make some dog biscuits, knowing exactly what goes into them and knowing there’s no preservatives or rubbish in them either! I can’t take credit for the recipe as it is in fact taken from Caesar Milan’s website (see here) but I’m going to show you a step by step tutorial with pictures so you’ll know what the biscuits are meant to look like at each stage. Mix the ingredients before kneading into a dough until it forms a ball. This takes approximately 3 minutes. NOTE: The mixture will start off very sticky then quickly becomes very dry. You may be tempted to add more water but stick with it and it’ll soon become a ball. You need the mix to be dry in order to make crunchy biscuits. Next roll the dough out until it’s ½ inch thick. To get the most out of your dough, re-roll the excess to make more biscuits. Place your dough pieces on a tray. As you can see the recipe makes a lot of biscuits, which keep fresh for up to a week or alternatively they can be frozen, with them lasting up to 6 months in the freezer. I hope you liked this doggy inspired DIY. Don’t forget to check out my previous doggy DIY which was this super simple dog bed! Have you ever made dog biscuits?